The chest sizes listed in the chart below are from Klim’s chart and I’ve double checked the actual jackets against the chart and it is accurate. But be careful… while the size Large is exactly what you’d expect with a 44 max chest, the smaller sizes are a bit smaller than normal and the bigger sizes are bigger than normal. For example, a men’s size Medium usually is styled with a 42 max chest and Klim’s medium is a 40” max chest. Same goes for larger sizes… an XXL is typically a 48” max chest, but Klim’s is a 52” max chest. Given the variation from “normal” for smaller and larger sizes, I’d highly recommend you measure yourself and/or measure a jacket that fits you well (take the link below on how to do that). Then choose a jacket that is big enough for your chest. It’s generally OK if the jacket is a bit bigger than your measured chest, especially in a mesh style since the wind blows right through (in solid textile jackets, being oversize is a bit more of a problem due to possible ballooning at speed). Also, an inch or two of room will be welcome if you want to layer under the jacket. Belly sizes are generous, but if you have a belly, you’ll want to make sure the jacket size you choose will accommodate your belly sizes as well. Overall sleeve and torso lengths are generous and will work for most average height or taller riders. Those of shorter stature may find the sleeve and torso lengths to be longer than ideal. 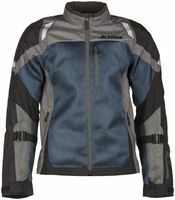 This new Klim Induction jacket will be just the thing for your hot summer riding months. Its a full mesh jacket front and back so the air flow through is unrestricted. Their new Karbonite Mesh material is about the most rugged mesh material I’ve seen in a motorcycle jacket so you’ll be getting the best abrastion resistance available for hot summer riding. In addition to the mesh parts of this jacket’s shelll, the shoulders and elbows and parts of the waist and sides of the torso are solid textile material to improve abrasion resistance and to give the jacket plenty of “structure”. The shell is heavyweight and substantial feeling (as compared to many other brand’s mesh jackets). And for impact protection this jacket is fitted with a full set of D3O armor… elbows, shoulders and back. The D3O in this jacket is a Klim exclusive. It is molded with more holes than the standard D3O and will vent better, which is welcome in a jacket made primarily for summer use (see our picture gallery). D3O is VERY comfortable to wear and is CE rated for impact protection. There is nothing else to buy. The overall design of this jacket is pretty straightforward. There are the usual storage pockets… two front hand-warmer pockets, one exterior and one interior chest pocket and one sleeve end pocket for your medical info (something Klim does on nearly all jacket styles).